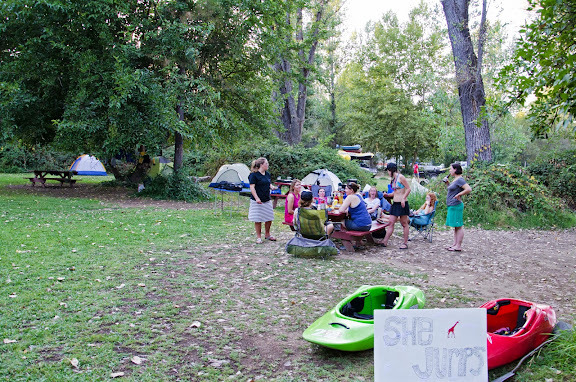 SheJumps Whitewater Weekend Recap! | Meghan Kelly Teles! 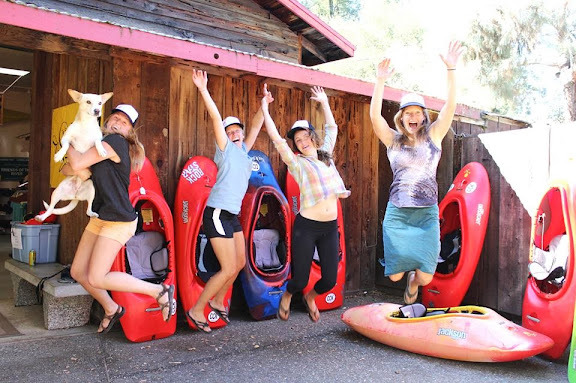 Twenty-five women came out to kayak, learn, camp, share stories, and laugh at the first annual SheJumps Women’s Whitewater Weekend on the South Fork of the American River in Coloma, California. 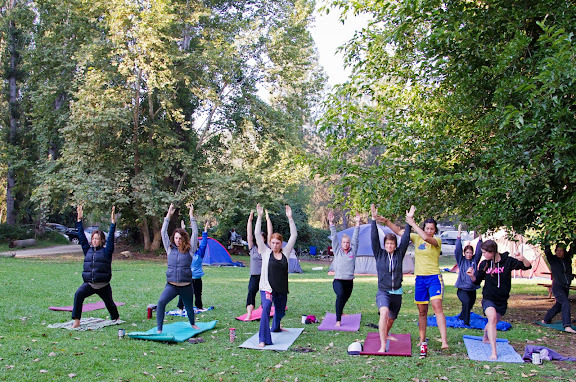 We arrived at Camp Lotus on Friday night and set up camp as women rolled in. We shared a few beers from Lagunitas, one of the sponsors, and set up a slackline, prepped our gear for the next day, and tried to make a fire with very little wood. The next morning we were up early to get ready to hit the river! 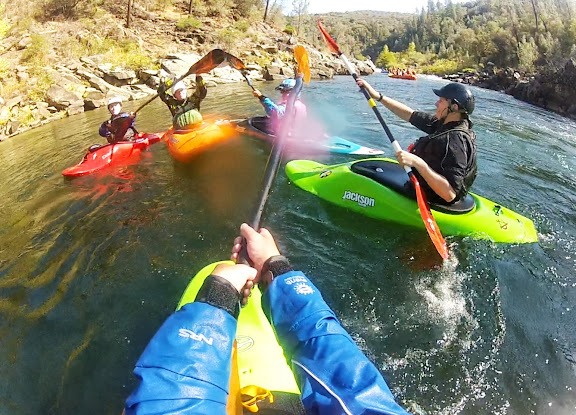 Clinics included a First Leap which was for never-evers or very new boaters, the Next Leap, for aspiring Class 3 boaters, and a Creeking Clinic with inspirational pros Shannon Carroll and Katie Scott. The first leapers at the put in! I think they’re ready! The creekers at the put in for Chile Bar! READY TO BOOF! Some women opted out of clinics and did a group run on the Gorge! High paddles after a successful gorge run! That night we enjoyed a potluck dinner, a few more beverages, and an inspirational slide show by Shannon Carroll. Shannon shares the women’s waterfall record and has completed some cutting edge expedition boating. Her slideshow covered her descents of the Royal Gorge and a recent women’s trip to Iceland. Shannon showing us the insanely beautiful and challenging Royal Gorge photos. 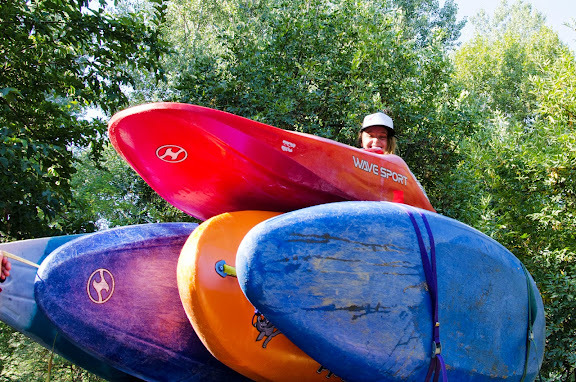 Thanks to Shannon’s slide show, most of us woke up fired up to hit the river! First we were treated to yoga by Antoinette McLean. 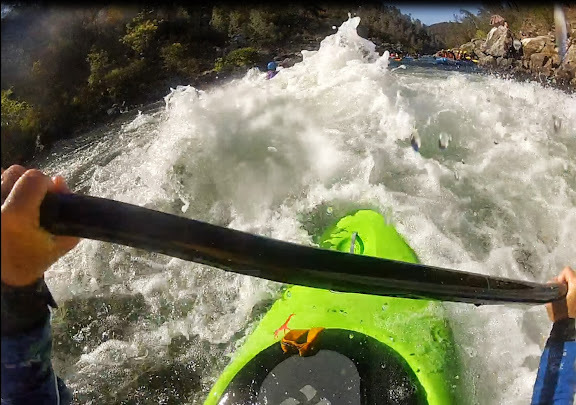 With new female boating partners, we set off to hit varying levels of runs and help each other shuttle! Shuttles are better with more boats! All in all it was a fantastic weekend and we can’t wait to do it again next year! Thanks CCK, Lagunitas, Patagonia, and OARS!